There will always be times in life when you have a lot of things going on, especially if you’re a person that wants a huge life. There will always be a situation where things will and can always go wrong or don’t work out. I can guarantee that! There will be deadlines at work. You’ll have a medical emergency. You’ll feel guilty about what you did last night, last week, and last year. The world, hell, the Universe will be screaming for your attention! 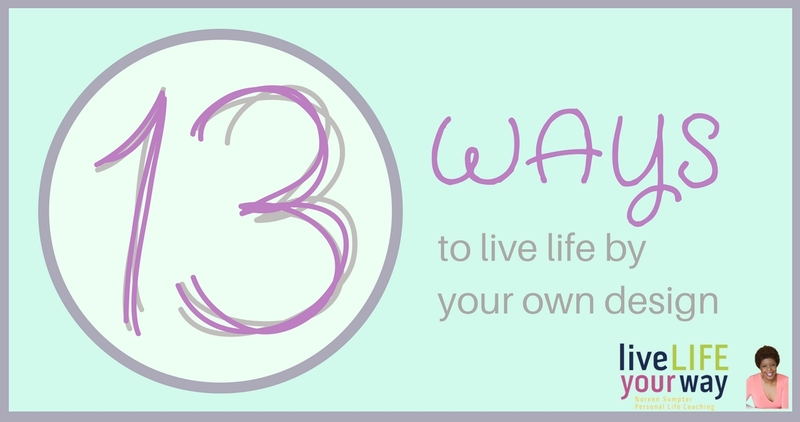 This blog includes a list of 13 ways to Live Life Your Way™ and live by your own design. Laundry isn’t important to me. Having clean clothes is what’s important, and I don’t have to do it. I can give it to someone else to do for me, and I can use the time saved to do something else for myself. If “no” is too hard for you to say, start simple by saying “no” but offer an alternative option that you’d prefer more. It’s important to stay in contact with your friends. People like to be acknowledged and feel like their friendships are important. There are 6+ billion people on the planet, and if you feel like you have no friends and no one loves you, then you know that you’re not being a good friend. You need to express love and share love. Love is addictive. Giving love and expressing love feels good. Try it. Send a text, email, or make a quick call to let someone know you’re thinking of them; it’ll make a world of difference to your friend. Try this on for size – send out “I was thinking about you” messages to your friends and people that you want to be friends with and see what comes back. It’s not weird. I’m doing five right now. Stop what you’re doing and just do it. The first five people in your phone to start. I just sent out eight instead of five and got three responses already in eight minutes! Generally, the people you keep in your phone are friends. You don’t have to keep in contact with everyone; most will be okay with it. However, keep in touch with people as best as you can – it will keep you happy and keep you inspired in your life. Surround yourself with things you enjoy or like. Don’t buy or bring into your emotional space things you don’t enjoy or like as they will pull emotional energy from you. When you’re in a dumpy mood or have low energy, having things around you that you enjoy can cheer you up and bring up your energy levels. For example, the social media platform, Pinterest, is an awesome mood booster, and you can view it on your computer or phone when you need a pick-me-up or a little inspiration. Keep a gratitude journal that you can go back to whenever you need a little boost. My clients who keep a gratitude journal and write in it on a continual basis experience a fuller and more expansive life and see their goals develop faster. Keeping a planner makes life less crazy. It’s good practice to put all the things that are important to you into it, including all things fun! Many people put in doctor’s appointments, work meetings, and children’s play dates, but they don’t really schedule time for fun. Get into the habit of adding fun time to your planner. It’s a really exciting thing to look in your planner and see that you’ve scheduled time for vacation, but it’s also great to see that you’ve scheduled time for fun things with friends or on your own. Balance your time and give yourself the right to say “no thank you” to an appointment you don’t have time for or don’t want to have. Write down your wins and keep notes on your achievements. Writing down your wins, achievements, and milestones will help you when you feel that you’ve hit a wall in your personal life and allow you to see your positive contributions. Make sure you like what you wear, have your own personal style, and look the way you want. You don’t have to have the latest fashions but it’s good to have your own look that’s unique to you. If you can’t afford a coach, a go-to group is perfect. Your group must not coach you or tell you what to do; what they’ll do is remind you who you are and the commitment and goals that you’re creating for your life. They’ll provide you with pep talks and reality checks. Also, make sure you’re a positive contributor to your go-to group to continue the circle of positivity. I feel that laughing at a movie is a compliment to all the hard work it took to bring it to the big screen. I had a great time and felt completely free! Laughing makes you feel better and is good for you. Laugh often and laugh loud – it’s contagious! Make and share jokes, engage your peeps, and laugh at lot. Every time you laugh, a comedian get his chops. LOL! Don’t go digging for sadness; don’t go dredging up old relationships and add them to your new ones. If you need a good cry, cry and complete it. Don’t blame other people for your sadness, your need to cry, or for your crying. If you’re stressed out, look at what’s causing the stress and create new actions to relieve it. Stress is a big killer and I’m sure you don’t want to die or suffer stress-induced illness. Don’t cover your emotions, express them. Release all emotions, frustrations, and anger in a healthy and responsible way. You’ll feel so much better after the release. Conversations and thoughts disappear, so write them down. Get yourself a little notebook and any time you have a great idea, learn something valuable from a conversation you’re having, or go to a yummy restaurant, write it down. Because let’s be honest, you live a big life, you have tons sitting in your brain, and you won’t remember. Save your brain cells!